Or Magma unplugged. This is an absolute gem of a live album, a crystal clear direct-to- digital recording from a 1992 jazz festival. As the title and line up suggests, the emphasis here is on Christian Vander's brilliant vocal compositions and arrangements, and the instrumental backing is generally minimal. The album opens with the 8 piece choir singing Emehntet-Re, a fragment from the Kohntarkohsz sequence unreleased on any mainstream studio album, over a simple piano backing. It's a piece of ethereal, celestial beauty that sets the scene for what is to follow in the next 40 minutes. Then we're into C'est Pour Nous, an Offering era piece which features Christian and Stella Vander in a vocal duet over a piano and bass accompaniment, with Philippe Dardelle doing a sterling job of propelling the piece with a bass line worthy of Jannick Top or Bernard Pagannotti. The main attraction is the two lengthy pieces which follow. Zess (extrait) is a sizeable chunk of another work as yet unreleased in a studio version, although fragments are on Inedits, Mythes et Legendes and sundry live albums. This is Vander's Kobaian vision stripped down to its essence; massed vocals and a McCoy Tyner style piano with the trademark Fender Rhodes present and correct . Some of the themes will be familiar to long term Univeria Zekt heads, but rarely have they been performed with such simplicity and clarity. The proceedings close with a lengthy extract from Wurdah Itah, in which the already stripped down original gets a bigger vocal arrangement but another minimal instrumental backing. The essence of the Theusz Haamtaak trilogy distilled and compressed, it's a glittering jewel which may be a good starting point for those overwhelmed by the original 70s albums like MDK. As well as being a superb drummer, Vander is a genuinely gifted composer and this album is a brilliant showcase for his ability to write rhythmically complex but melodically accessible vocal music. Although he is credited with drumming on this album, for most of the time any percussion is so low key as to be inaudible. 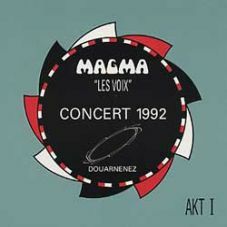 Bass and electric keyboards surface when required, but mostly this album is just what it says; les voix, in all their glory. 5 stars if you're already a Zeuhl fanatic, but at least 4 stars whatever your taste in music.